Time sure does fly when you’re doing as little as possible. Monday was a holiday for my university and many others so I pretty much took that as an excuse to have a 4-day weekend and have been enjoying a lot of cooking, baking, and socializing. Knitting has been there on the side but it’s a slow haul at the moment. I’m on a deadline and have to concentrate on this pair of gift socks before the recipient leaves the country. It’s a basic 64-stitch, 3×1 rib on the leg and top of the foot, which is fast becoming my go-to approach to Socks That Rock in the absence of any other ideas. They’re a gift for my academic supervisor, who quite frankly deserves many many more knitted socks than these, and I plan to not make this the last pair. She picked the colour from 3 offerings and I hope she likes them (this colourway is Jail House Rock). A year and a half ago I gifted her with a knitted sweater, though, so I think I’m doing pretty well in the knitted karma area. She’s leaving the country to take a new position for at least a year, which means I won’t get to go sit quivering in her office clinging for advice any more (unless via email, which although often effective lacks the sofa and sunny window), and yes it’s all well and good that I’ve got the PhD now and am supposed to be a grown up and she’s getting all the awesome opportunities an awesome academic should get, but WAH WAH NO FAIR. Ahem. So I gotta finish these socks today, or at least come darned close. Then summer of shawls can resume. What is in your summer knitting queue, my friends, gift or otherwise? Whether you have a holiday or no, I hope your knitting is close by and that you have a summer beverage to go with it. STR lightweight or medium weight? I am using mediumweight now and I think my 58 stitch plain stockinette socks are going to be too big. I have US size 7 feet. Aww, you’re so sweet! She’s going to love those socks! sorry she’s leaving though… for a year… she’ll be back, right? I’m knitting a little Tomten (hee, love it) but can’t blog or Rav about it due to the little dude’s mum seeing it. It’s a surprise. Happy holiday, lady! Those socks are SO beautiful, I can hardly stand it! Happy Canada Day! Aren’t lazy summer days (that aren’t too hot) the best? Nice socks. I’ve been reading your blog since discovering your Basic Black cardigan on Ravelry — haven’t made it yet but am thinking of it for some Handmaiden Flaxen. I see that we’re both relatively newly-minted PhDs (mine was defended 3 years ago), so I also enjoy your occasional commentary on the academic life and how knitting fits into it. What am I knitting right now? Just finishing off an Indigo Ripples skirt, have to finish the second sock to a pair in Kureyon Sock yarn, a Chevron scarf in Handmaiden Cashmere, a simple Shetland lace pattern in Seasilk, and just started a plain stockinette scarf/shawl in Big Baby alpaca — no monoknitting for me! Socks socks socks on my knitting list – no surprise there! What the colorway of them thar socks? My summer knitting has gifts, a vest, a sweater and…whatever else I cast-on just because!! I NEED to finish the baby cardigan I’ve been working on. I have half a front to go, and then the seaming which is probably why I haven’t finished it already. Don’t want to seam it. Ugh… It’s a gift, too, which doesn’t make the process any easier. She’s already had the baby, but I think the cardigan might be too warm to wear now (it’s certainly too big, too) so… I don’t know. Need to finish by .. end of July!! Yes!! I also need to finish up a couple of other projects, mainly sweaters I’ve cast on and never finished. The FUN summer knitting will be Juno Regina from Knitty. 🙂 Can’t wait to get that one started! And I’ll probably knit another pair of socks, too. 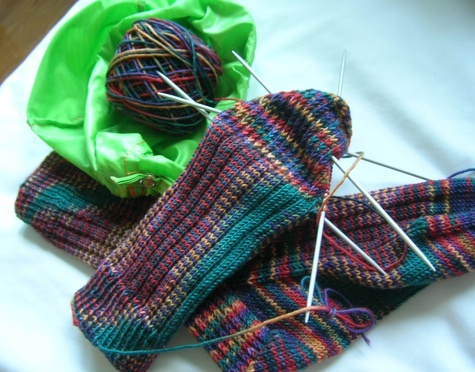 Sock knitting is so lovely and easy and portable. I love the socks! You are a good soul to knit such lovely things for your friend. I am sure that she appreciates it! I just finished a tam from Angela Wu’s Three Tams (Knitty, Winter ’07). It’s blocking now, but it’s a bit small due to my using some Colinette cotton/viscose (no stretch). It may have to go live with a friend’s daughter. But I LOVE the color combo and am thinking some mittens or even a sweater will be in order. My proud moment was teaching myself to knit “American” style, and carrying both yarns, one in each hand. ‘Two-fisted knitting’ is what I have decided to name it. It goes with two-fisted drinking, or rather it comes before the drinking. Together would be, well. I’m currently working on the Cozy Wrap (Knitty, Fall ’04) and enjoying it immensely. However, I’m apparently going to have to take a quick break to finish a baby sweater for my friend who is in the hospital having her son a bit sooner than planned.